England States and Bishop Jean Cheverus was named the first Bishop by Pope Pius VII on April 8.1808, although he was not consecrated until October. 1810, by Bishop Carroll in Baltimore. Because of the much longer distance entailed in traveling to this location. the people in East Attleboro decided it was time for them to have a Church of their own, and they sought permission for this from the Bishop of Providence. The railroad had been built in Attleboro in the I830’s and a few of the Irish who had come to work on it had settled here. Consequently. a few more Catholics were now living in the East section. When Bishop Hendricken gave his consent that a Church could be established in Attleboro. money had to be raised. The parishioners themselves sacrificed tremendously from their meager earnings to contribute to the building fund. One parishioner was even reported to have mortgaged his home to contribute the money to the church fund. and it took him many years to pay off the mortgage. Many money raising events were also held to augment the fund. such as fairs and picnics. Many of these events were held in a field where the Triboro Plaza is now located. In November 1882. Reverend John O’Connell was given the assignment of being the first Pastor of St. John the Evangelist Church plus the mission church of St. Mary’s in Norton. On the Feast of the Epiphany. January 6, 1883. he began his duties as Pastor. For almost a year he continued to hold services in the Union Hall. Attleboro were Job B. Savery. S.P. Lathrop. and B. Porter. Ir. Construction was begun immediately on the basement and when this was completed in December. it was used as the meeting place for services. Twenty pews were installed. and this was sufficient to accommodate the number of parishioners for Sunday Masses at this time. Some of the family names rccorded as being active workers in the building drive for the Church were the Dennis and Bowen families, the Gilroys. the Simms. as well as the McCambridge. Daveys and Perry families. 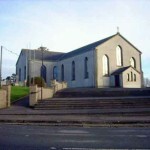 The first marriage performed by Father O’Connell in the new church was between James Irvin Briggs and Catherine O’Connor on January 4. 1883. The witnesses were John Costelloe and Margaret O’Connor. The first Baptism recorded in St. John’s was Delia Lemarche, daughter of Francis Lemarche and Grietta Gaboury on March 25. 1883. The sponsors were Henry Gaboury and Delia Laroux. “The dedication took place September 22, 1885. the Most Reverend Bishop Hendricken conducting the service. which was very imposing and impressive. Father O’Connell has accomplished much since he entered upon the work of this parish, and he has not only endeared himself to his own people. but has gained the respect of the community by his courteous and friendly bearing towards those with whom he has in various ways. both public and private, come in contact”. The new ediface was a wooden structure built in Gothic style. It had a high spire with a cross on the top. beautiful stained glass windows and seated about seven hundred people. There were about 600 parish members. The cost of the church is not known, but according to records. there was a $3,000 mortgage at six percent interest on the building at this time and a sketch of the History of Attleboro says the property was valued at $25,000. The organ in the new church was chosen by Miss Christina M. Scott. a graduate of the New England Conservatory of Music in Boston. She had furnished the music for the Masses in Union Hall and became the first organist in the Church. She also founded and directed a choir. She later became Mrs. Christina Foley. the mother of Stephen H. Foley. 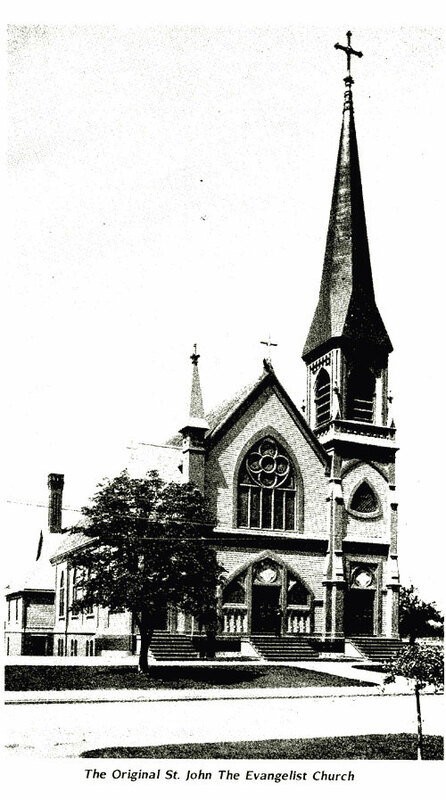 who was mayor of Attleboro when the second church was dedicated in 1932, and was the grandmother of Mary Foley Peters. Mary Peters recalls her father telling about his mother and him accompanying Father O’Connell to say Mass in the Mission Church of Norton (before St. Mary’s was built). which was located at the corner of Taunton Avene and Barrows Street. He served as an altar boy and his mother provided the music for the services. These visits were usually made in a horse drawn vehicle. sometimes a sleigh. depending on the weather. Father O’Connell. fondly known as “Father John” by his parishioners. was a much a loved County Tipperary native having been educated at St. Patrick College. Thurles. On November 1st. I869, he entered Maynooth College to pursue theological studies. He was ordained to the priesthood June l. 1874. Shortly after he was invited by Bishop Hendricken to join the Catholic priests in New England and he accepted his first assignment as assistant at St. Mary’s Church in Fall River in August of that year. After six years there. he was assigned to Immaculate Conception Church in Providence for two years. At this time, Bishop Hendricken chose him to become the first Pastor of the newly created St. John the Evangelist Parish in Attleboro. plus the Norton Mission. When Father O’Connell came to St. John’s. he was doubtless pleasantly surprised to find as one of his parishioners, Mrs. lohn Ryan Dennis. With whom he had grown up in the town of Ballingarry in Ireland. Margaret Dennis recalls frequent visits by Father O’Connell to her grandparents’ home on Hope Street. The house. the yard, the children. and adults all had to be immaculate when t’was known the Pastor was coming to visit! fund raising activities to diminish the debt. The parish grew steadily in numbers. As well as stronger in faith. Father O’Connell is remembered by Margaret Gaynor as always remaining close to his parishioners and caring for their needs. She too recalls him making frequent visits to her home to visit her widowed mother and two children. During his twenty-eight years of service at St. John’s. 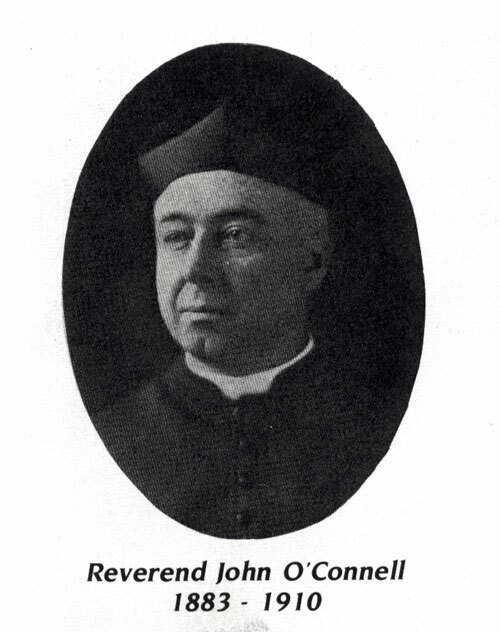 Father O’Connell was a member of the Board of Examiners for Clergy in the Fall River Diocese, Chaplain of St. John’s Knights of Columbus and the local division of the Ancient Order of Hibernians. The Funeral Mass was celebrated by the Most Reverend Daniel Feehan. Two hundred priests attended and the church was filled to capacity. Proof of the esteem which Father O’Connell held in the city was that on the morning of his funeral, stores and offices were closed in the center. most factories closed during the hour of the funeral. schools closed early prior to the funeral. and the National flag was at halfmast. At his own request. Father O’Connell was buried in St. John’s Cemetery. 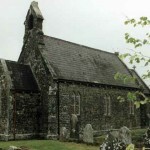 which he had just recently acquired for the parish, and at his grave near the entrance to the cemetery is a monument with a Celtic Cross and inscribed. I received your letter some days ago. It was good hearing from you, and knowing that your are the grand nephew of Father O’Connell who established this parish. It was really a coincidence that the information about our 100th Anniversary of the parish here reached the papers in Ballingarry. 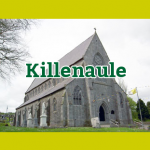 On the occasion of the 100th Anniversary we had a booklet publish that will give you all the information about this parish and your uncle’s tenure here. It will also give you a photo of the Church that Father John built. Sadly, that Church was burnt down in the 1930’s and a new Church was built to replace the wooden structure that your uncle built. From all accounts your uncle was a fine man and priest, loved and respected by all. I believe that the rectory that we priests live in now was built by your uncle, I am sure that you will find the booklet very interesting. You mentioned that you wanted a photo of the cemetery where your Uncle John is buried. I got a camera and took two shots of the stone on your uncle’s grave. The photo will also give you some idea of the cemetery that he established. I hope that all this information will tell you something of your uncle John and I am sure that the many pages in the booklet devoted to him and his priesthood at St.
John’s will enlighten you about how good and great a man he was. I am happy to send you this information. Thank you for your letter and I ask your prayers for myself and the good people of St. John. 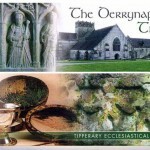 I forgot something, The booklet speaks of a Margaret Dennis whose grandparents came from Ballingarry and who frequently had Father John over to their house. Margaret is still alive with a keen mind and I let her niece know about your letter and I told her that you might be getting in touch. Her address is: Miss Margaret Dennis; 94 Hope Street; Attleboro, Mass. 02703 U.S.A.
Take care, John, and the best of every blessing. God bless!